TransMath® is the unique prealgebra program for Florida’s students needing more than the average core. This Adoption Review Site was created for Florida educators to learn more about the TransMath pedagogy and to review all components in a digital format. Please begin your review by downloading and printing the Reviewer Guide. Thank you for your consideration. We have created a comprehensive Reviewer Guide with step-by-step instructions for the digital review process. Please download and have this guide available before you begin. Please watch this brief overview video for an introduction to TransMath before beginning your exploration. to support your review of the materials. 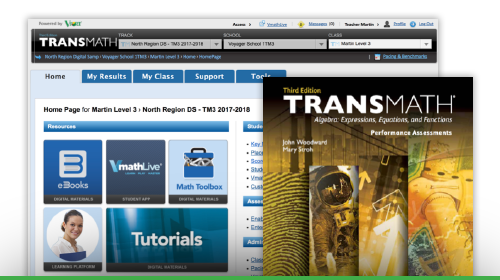 TransMath is proven to accelerate students toward grade-level proficiency. Results show consistent gains in school districts across the country. Read our Evidence of Effectiveness Summary to see those results and watch the customer testimonial to hear what educators have to say about their success using TransMath. Click here to explore the Florida adoption TransMath overview. © 2018 Voyager Sopris Learning is part of the Cambium Learning® Group, a leading educational solutions and services company committed to helping all students reach their full potential. Voyager Sopris Learning provides innovative, evidence-based instructional solutions and professional development services to preK–12 students and their teachers.